"IT'S SO EASY TO FORGET WE ARE LOVED WHEN WE EXPERIENCE DISAPPOINTMENT. IS THERE ANYONE LEFT TO REMIND US SOMEONE CARES? DOES ANYONE STILL LOVE US? MAYBE IT'S OUR JOB TO REMIND PEOPLE OF THAT." I felt such an urgency after reading this to post here. Like someone needed a reminder. Something to calm their heart. So here I am, to remind you that someone cares. That you are loved beyond measure. That you matter. That you mean something special to someone. That you bring a smile to someone's face. That you have made a difference. That you bring something so very good to the world and the people that surround you. That kind word you said the other day? That small, but selfless, thing you did? That compassionate look you gave? That changed someone, and it was carried and passed on to the next person, and the next, and the next. Like a small burst of light. You did that. I know you are tired. I know you are discouraged, afraid, overwhelmed, weary, burnt out, drained, homesick, heartsick, hurting, bruised, lonely. You feel unworthy. Not good enough. Like nothing you ever do will truly matter. But it does. It matters so much. Despite all those feelings, despite beating yourself up every single day, please hold onto the hope that someone out there is rooting for you. That someone wants you to succeed and to feel joy. That someone wants you to see your own worth. To see what they see. Hold onto that. Tightly. And keep going. You will be okay. You will. 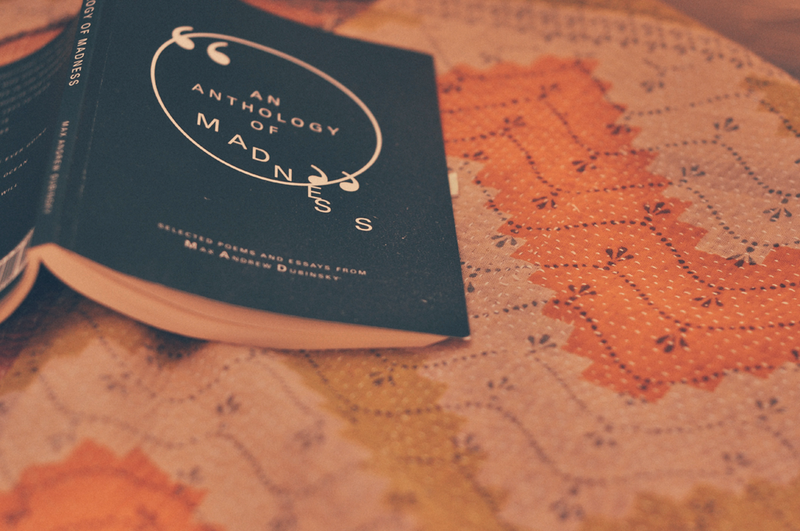 *The quote at the beginning of this post is from An Anthology of Madness, by Max Andrew Dubinsky. This book. It's a super quick-read, but such a powerful one. It's honest, painful, authentic, and moving. It makes you feel about 27 different emotions - sadness, hurt, anger, all of them. I felt defensive, I felt uncomfortable, I felt compassion and empathy. And I felt hope. This book grabbed my heart and took it for ride - and, in some small way I can't quite describe, it also started a healing. A healing of wounds that I had pushed to the very back of my heart - that deep, dark place where my most painful experiences live, that I ignore most of the time. I was going to say that this book brought a light to that place... but instead, it felt like someone came and sat in that darkness with me and simply said, "I understand. I'm screwed up, too. It's okay, you're not alone." Thanks, Max, for sharing your world, and your words, with us. May we all help others - may we all truly see and love others - in such a genuine, honest way.